Ok now let's start trading. We use 15 minute time frame because it allows catching the best entry and exit opportunities. With hourly charts, for example, when the signal is there it is quite often already too late to react / enter. Let's look at the current chart to see how Pivot points were found. First, they should note where the market has opened today in relation to the Pivot Point (PP): above the Pivot Point or below it. The answer to this question provides the first clue about traders' biases for the day, e.g. if the market has opened above Pivot Point, traders will be bias towards taking long positions, on the contrary, opening below the Pivot Point would suggests shorting for the day. 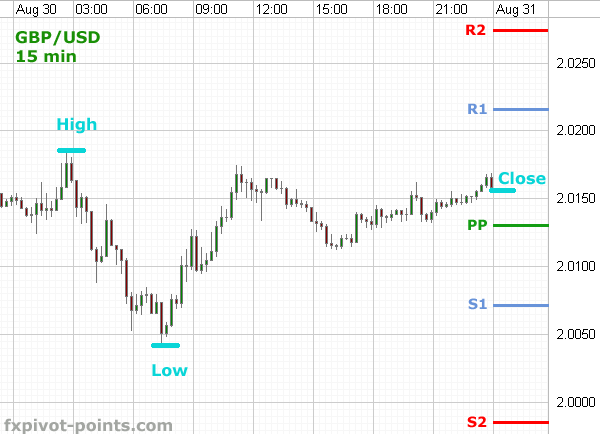 With some small distance away from the Pivot Point it is considered to be a good morning for trading. It is very much suggested to wait for a pull back towards the Pivot line before taking a position. 15 minute charts in this case help to catch the right moment for entry. With the second — distant opening (below S1 or above R1) — we have very high expectations that the price will try to correct such "distant irregularity" and thus instead of progressing further away from Pivot Point it will try to move back towards the Pivot — the gold-middle point of the day. As a result, we will typically see a ranging market which does not produce much of the trading opportunities. The expectations are that the price will revolve around Pivot Point for the rest of the day — nothing to do for us, we stay out.